Embark on a journey in the highlands of the Everest region with the professional guidance of the Himalayan Trekking Team. Many people think that trekking in the Himalayas is reserved only for the skilled mountaineers. The truth is quite different though! 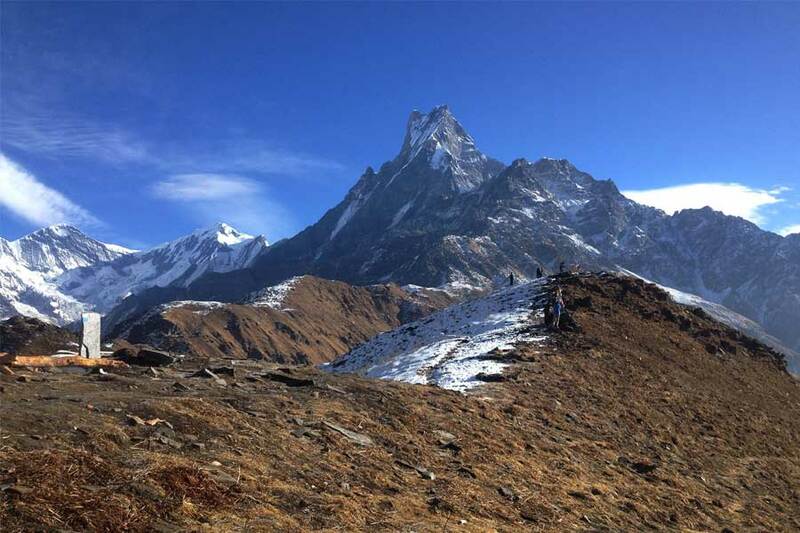 Everest High Passes Trek is fit for both new trekking enthusiasts and people with climbing experience who can use this trip as an introductory exercise before embarking on a more challenging route. During your Everest High Passes Trek you have to pass From Kongma La, Chola passes and the mystical Tengboche monastery, the glacial Gokyo lake, Kalapattar. This trek offers the best views of the Everest and of course the Everest Base Camp, one of the most famous locations on the planet. and the highest point in the World. For travelers interested in observing the majesty of Everest and embarking on a high altitude journey, the Everest High Passes trek is highly recommended. Our journey starts with a scenic flight to Lukla. There, we will meet up with rest of the team and begin our trek. We descend towards the Cheplung village. At Cheplung we get to see beautiful views of Mt. Khumbila. Mount Khumbila (5761m)also known as “God of Khumbu” sacred mountain which has never been climbed. Our journey then continues towards Phakding. Overnight in Phakding. Overnight in Phakding. This is a big day as we’ll be covering a height of over 800 meters and that too mostly on the last part of the trail. Also, we will be crossing through loads of long suspension bridges over the Dudhkoshi river. The first part of trail is easy, we cross the Dudkoshi and walk along the path west of the river. We pass through pine forests and small villages along the way. We continue up north the Benkar valley, we cross the Dudhkoshi again and continue forwards passing through the Chumoa and Monjo villages.We will then reach the Everest National Park entrance gate at Jorsalle, where all the climbing passes are checked and verified. Here, you will start seeing more sights of the snow-clad mountains ahead. The last parts of the trek get tougher. We must climb a steep incline to reach the Hillary bridge. The Hillary bridge is the last one on today’s journey, it is also the longest and the highest. We then continue hiking up a steep path leading up to Namche Bazaar.Namche Bazaar is a famous town in the region. It is the starting point for all expeditions in the Everest region. It is a historic town with markets selling everything from Tibetan artefacts to trekking and climbing equipment. There you will get good views of the mighty snow-clad peaks in the region. It is rich in history and culture, so there’s a lot more to see. Overnight in Namche Bazaar. This day is primarily meant for an acclimatization trek to a higher altitudeand then back to Namche to sleep one more night at the current altitude. In a span of around 48 hours you will have had climbed up to 11,290 ft / 3,440 m at Namche from 4,600 ft / 1,400 m at Kathmandu, therefore it is very necessary for you properly acclimatize. We will be hiking up to Khumjung village. It is a small but vibrant Sherpa village. There we will be visiting the Hillary School and the Khumjung Gompa that has a scalp on display, which the monastery claims that it belongs to the mythical Yeti. This is a good opportunity to learn more about the Sherpa culture, taste local cuisines, and observe the never-tiring views of the Himalayas. After our day of exploration, we make our way back to Namche Bazaar. Overnight in Namche Bazaar. With a good breakfast checked off the list, we will prepare to trek up to the renowned Tengoche monastery at Tengboche village. It is the largest monastery in the region and one of the most significant ones as well. The monastery is perched in a beautiful spot on a high ridge with Mount AmaDablam in the background. It is surrounded by pines, azaleas and colorful mountain rhododendrons, and the views are just fantastic; you can get good views of Mt. Everest, Nuptse, Lhotse, AmaDablam and Thamserku! The early parts of the hike up to Tengboche is pleasant, with loads of opportunities to get good pictures of the beautiful Himalayan landscape. You will pass through small villages and Buddhist stupas along the way and may also come across an old man and a woman who claim to maintain the trail, they have a big sign in four languages asking for donations for maintenance. Midway along the trail splits. Three different signs point towards the Khumjung village, other Gokyo, and Tengboche respectively. As we approach the last part of the trail, things turn steep! The last few kilometers until we reach Tengboche has the most height gain. Overnight in Tengboche. Many claim the trek from Tengboche to Dingboche turned out to be one of their favorites of the entire journey. The trail promises an outstanding view of the mountains like you’ve never seen before. The first part of the trail is relatively moderate with river crossings along wooden bridges, climbing up large steps through colorful gateways, and the ever-existing views of the Himalayas. You will passthrough lush forests of birch, confer and rhododendron trees. From Tengboche we descend to Debuche and cross the Imja River. We then continue towards Pangboche through the upper Pangboche trail. We get to see the Pangboche Monastery along the way. The climb to Dingboche begins once we reach the Imja Valley and the Lobuche River. The trek to Dingboche is as picturesque as the village itself. Overnight at Dingboche. Dingboche is above the tree-line, people! You know what that means, it means it’s time to acclimatize! We will do some hiking around Dinboche. Weshallascent a ridge behind the village, from where wecan get views of six of the tallest mountains in the world that includes the Lhotse, Makalu and Cho Oyu. Not only those, we get good views of the Cholatse and Taboche peak, and other snow-clad mountains rising above the Khumbu Khola Valley, particularly Lobuche West, Lobuche East and Lhotse. 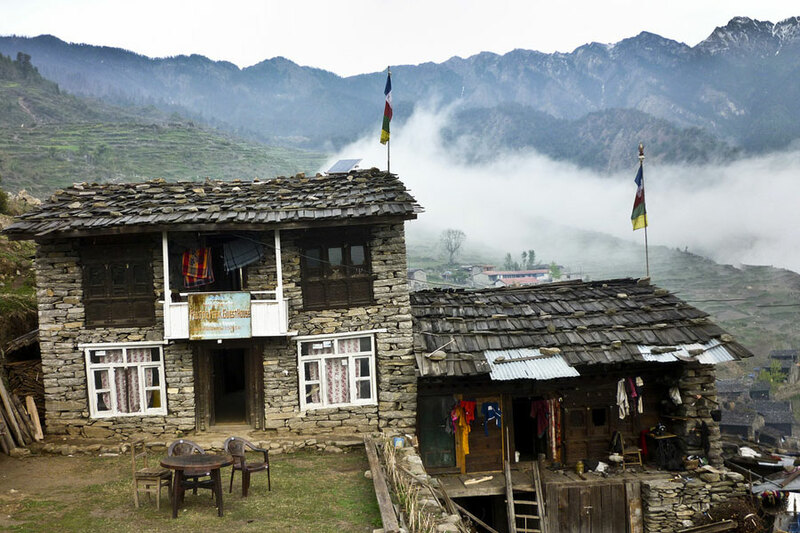 The spot also offers spectacular views ofthe ImjaKhola Valley and the attractive Dingboche village. Overnight at Dingboche. We first pass through stone-walled fields and the Imja Khola valley to enter glacier moraines amongstthe Himalayan giants. We head towards Bibre, a yak herdsman place, directly across the valley lie the fantastic AmaDablam and the AmphuLabsa mountains. 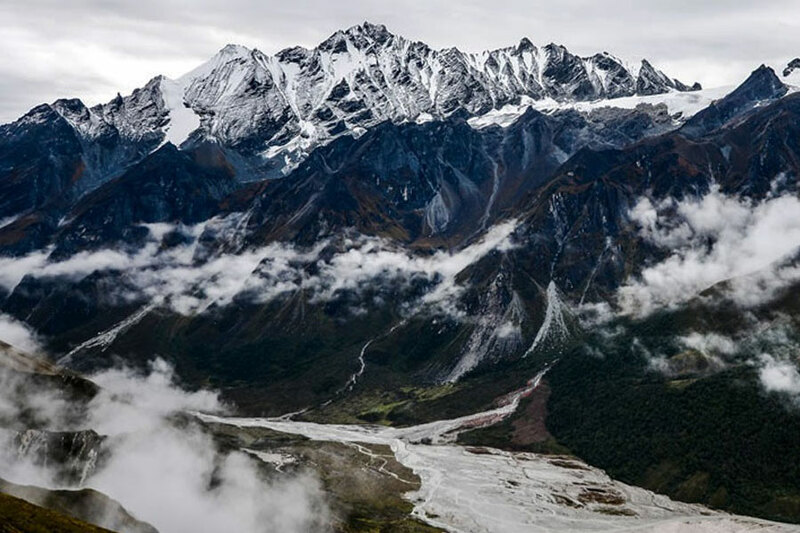 We pass through trails intersected by icy streams and walk some more to reach Chhukung. We have lunch here and then head for a climb of Chhukung Ri. The top of Chhukung Ri offers marvelous views of AmaDablam and AmphuLabcha peaks. After soaking in the views, we return to Chhukung. Overnight in Chhukung. Today is going to be one of most challenging treks of the trip. We start early to the highest point of the entire trip- the Kongma La pass at 5535 m. We have two options to get there – take a trail over a hill north west to Chhukung over the Nuptse Glacier moraines or return to Bibre and trek through a trail above the Niyang Khola. The top of the pass is decorated with cairns and Buddhist prayer flags. We then descend towards Lobuche. Overnight at Lobuche. Note:Crossing the Kongma La is optional, if you wish to not go through it we can head for Lobuche from Chhukung. The trail to GorakShep is rocky and makes it difficult to walk quickly. We move along the Khumbu glacier. The hike isn’t so difficult, it’s steady with minor ups and downs, but the elevation can make things very much tougher. On GorakShep you feel like you’re walking on a beach because GorakShep is a frozen lakebed covered with sand. Once GorakShep is conquered, we head for Everest Base Camp. The trail to EBC is also very rocky and degrades into larger rocks as closer we get to the EBC. The rocky terrain, the ascents and descents on a glacial path, and the elevation, make this trail challenging. But, the views from there and the feeling of being there away from the “world” is incredible. It isn’t more about the views but it’s more about the personal sense of achievement you get and to realize that you’ve made it! You can see the mighty Khumbu Ice fall, the upper part of the Khumbu glacier, stunning views of Nuptse, Khumbuste and Pumori, and many other Himalayan giants from EBC. We will head back to spend the night in GorakShep. Overnight in GorakShep. The trek starts early in the morning. We walk up a slope admiring great views of Lingtren, Khumbutse, and Changtse mountains. Kala Patthar is a famous landmark in the region, it literally means black rock. Some would say, Kala Patthar is the highlight of the whole trip. Since the mountains surrounding EBC are so massive, you can’t actually see Mount Everest. It is on top of Kala Patthar, where one can see the best view of Mount Everest. Hikers walk early in the morning to Kala Patthar to witness the sunrise from Kala Pattar. After spending some time at Kala Pathhar, we head back to Lobuche. Overnight in Lobuche. We leave Lobuche as wehead downhill alongside the Khumbu Glacier. Soon the trail splits, we take the one on the right. We admire awesome views of the Awi Peak on this trail and pass through a stupa. Soon, the trail becomes sloppy and we get a beautiful of the CholaTsho Lake nearby. Further down the trail we pass another lake then cross a bridge over the Chola Khola to reach Dzongla. Overnight in Dzongla. Today, the trek is going to be demanding but worth every sweat and tears because the views are extraordinary. We go uphill and soon get views of the Cho La Lake, the AmaDablam and Cholatse mountains. The climb is challenging and made more difficult by boulders we must make our way through. Just before reaching the top, our trail curves round a crevasse making the climb even more challenging. Once the final climb is done, we reach the top filled with prayer flags and cairns. After admiring the jaw-dropping view from the top we start for a long but easy descent to Thangnak. As we descent we find ourselves at the edge of the longest glacier of Nepal, the Ngozumpa glacier. Soon, the second Gokyo Lake on the series of six lakes appears and no sooner the third Gokyo Lake, too. We head for Gokyo Village. Overnight in Gokyo Village. This is going to be an exciting day- there’s going to be loads of hiking, mouthwatering views, and a sense of complete satisfaction. We make some climbs to reach the fourth and fifth lakes of Gokyo, we head towards a viewpoint called the Scoundrel’s Viewpoint and also climb the Gokyo Ri, the views of the Gokyo lakes and the surrounding mountains is breathtaking from the top at Gokyo Ri. Expect marvelous views of Cho-Oyu, Gyachung Kang, Everest, Lhotse, Nuptse, Makulu, and Ngazumpa Glacier- the largest glacier is the world. Overnight in Gokyo. We set off early walking alongside the DudhPokhari for a while andthen descend towards the Renjo La pass. The views remain extraordinary en route,the views from the Renjo La pass are as beautiful as from Gokyo Ri with the third Gokyo Lake and Gokyo Village beneath the Ngozumpa Glacier. The top of the pass offers magical views of Mt. Everest as well. We soon descend towards thesouth side of the AngladumbaTsho Lake. The descent can be tricky as the trail might be covered with ice. We also see nice views ofRelamaTsho and Renjo Lake on the descent. We soon make our way through a narrow valleylittered with giant boulders to reach Lumde. A brief walk from Lumde we reach Marlung. Overnight at Marlung. We head down from Marlung on historical trade route followed by traders for hundreds of years to reach Thame. We cross a few few brides en route to Thame. From Thame we go further downhill passing through some villages to finally reach Namche Bazaar. Overnight in Namche Bazaar.